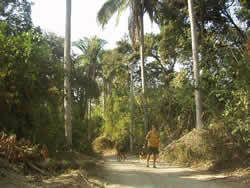 For day hikes, or just a good old adventure into the forest, Sayulita is a prime location for jungle and beach trekking. Our town is surrounded by lush tropical forests that within minutes can take you from cobblestone streets to an enchanted world under the canopy. Town to North End Trail: This is an easy hike and will take you to more than a dozen vistas, some secluded beaches and is great for bird watchers. Follow the beach north or more easily, follow the road that parallels the beach, all the way to the end. You will notice that the cobblestone ends and it becomes a dirt road, which is closed off by a chain (so that ATVs don’t pass through). This is your trailhead. On this trail, you may encounter the endemic Golden Cheeked Woodpecker, Citreoline Trogon or the Black-throated Magpie Jay, as well as many more varieties. If you’re quiet enough, you might be able to see some animal life, such as the Coatimundi (or Tejon, as it is referred to in these parts), or a Collared Peccary. Things to watch out for in the forest are ticks (especially a small variety, called guinas that live in tall grass and wait for approaching animals to attach onto), scorpions, which hide out in dry leaves or dead tree trunks and dangerous snakes, like the Coral Snake and Mexican West Coast Rattlesnake. Be on the lookout also for thorny plants. It can get really hot out there; bring water and swim trunks, if you reach Playa Malpaso. If you do swim, beware of rip tides, due to the steep sloping beach. Town to Playa Los Muertos and Carricitos: Follow the road at the south end of the beach, toward Punta Sayulita. Continue through the cemetery and it will lead you directly to Playa de Los Muertos. This is a nice beach for hanging out, swimming and even snorkeling. Continue following the road as it bends to the right through the forest to a small trail (signed “playa”) down to Playa Carricitos. This road is another good place to enjoy the sounds of nature and maybe even pick a fresh mango. 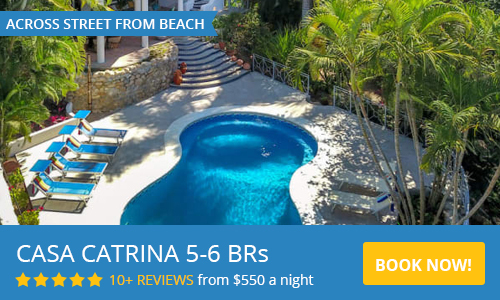 As the road takes you up and drops you back down, there is an amazing vista view of the south coast all the way to Punta de Mita. Caricitos is great for sunbathing, sunsets and exploring tide pools and dry forest treasures. The waves here are often too big for safe swimming. Look for the fragrant Plumeria flower and the bright yellow flowers of the Primavera tree in the springtime. Cerro de Mono: A 360°, captivating view awaits you, from the Bahia de Banderas to San Blas, on Cerro de Mono, or “Monkey Mountain.” To attempt this adventurous trail, it’s best to go with a local guide, as the trail winds through dense forest and complicated rancho crossings. It is usually a three-hour hike round-trip and is strenuous due to the rugged terrain. Make sure to bring your camera; along the trail you will see petroglyphs and artifacts from ancient indigenous tribes who lived in the area. The array of flora that decorate the landscape will captivate you as you enter into the immense canopy of the forest. Along the hike, be on the lookout for the tracks of jaguars, ocelots and coyotes. Bird watchers will enjoy viewing Military Macaws, San Blas Jays and even the Russet Crowned Motmot. Make sure to bring hiking shoes, lots of water and binoculars, as well as your camera.